SelfieGeeks Selfie Stick Just $19.95! Comes In 3 Colors! You are here: Home / Sponsored / SelfieGeeks Selfie Stick Just $19.95! Comes In 3 Colors! SelfieGeeks Selfie Stick Just $19.95! Do you take Selfies? 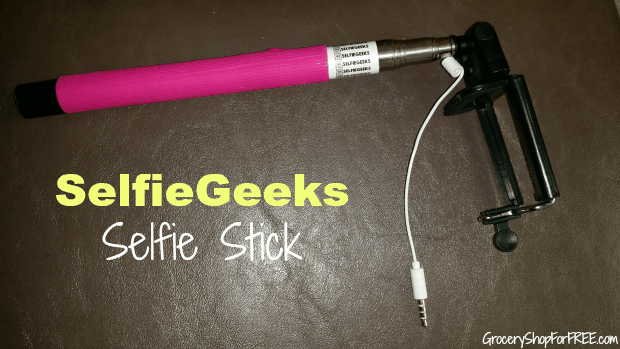 SelfieGeeks sent me a hot pink Selfie Stick to try and share with you! I know it’s a huge trend, I just have never gotten in to doing them. I don’t think I like the way I look in pics, that’s probably why. But, if you like doing Selfies then this might be right up your alley. The SelfieGeek Selfie Stick will help you take Selfies from further back so that you can incorporate your friends or a background better. The device uses special grooved pole design to ensure proper locking, keeping your smartphone safe and stable at all times. It‘s made according to level rule, meaning you can use it for more than 3 hours without getting tired. Sturdy aluminum alloy structure provides great durability and light weight, making the device ideal for travelling. They come in Blue, Black, or Pink and are $19.95. If you are a Selfie taker – then this is definitely worth checking out! I was able to use it within a few minutes of taking it out of the box. It is compact enough to fit in a glove box, purse, or pocket. So, check out SelfieGeeks now.